Sunderland manager Steve Bruce says Steed Malbranque's move to St Etienne on Wednesday came at the right time for the player and the club. The 31-year-old midfielder ended a three-year association with the Black Cats to join the French Ligue 1 club, having scored twice in 112 games. "The defining moment was that he let his wife and children go back to France," Bruce told BBC Newcastle. "The writing was on the wall, the time was right for him and us to move on." Bruce continued: "He had a year left on his contract, he was the highest earner at the club, and we were left in that situation to offer him a new contract. "I wish him the best of luck, and he's been a terrific little player for the club." 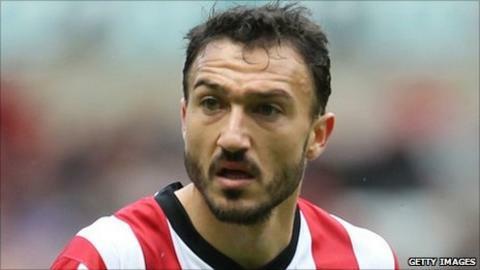 Belgium-born Malbranque joined Sunderland from Tottenham in July 2008, having previously enjoyed spells at Fulham and Lyon. Sessegnon has been fantastic over the summer, over the pre-season, he's the kind of player who gets you off your seat with a trick. Meanwhile Bruce has been impressed by the efforts of former PSG winger Stephane Sessegnon, who has carried the form that brought three goals in 14 Premier League games at the end of last season into pre-season. "We sort of changed him from being a wide player to going through the middle, he's always been in a wide area with Paris Saint Germain," Bruce said. "It was a fluke to be honest, we put him there because we didn't have anybody else. But he did particularly well - he enjoys it and the main thing is he scored some goals. "He has been fantastic over the summer, over the pre-season, he's the kind of player who gets you off your seat with a trick." You can hear interviews, reaction and discussion on Sunderland throughout the season on BBC Newcastle Total Sport - weekdays from 17:30 BST.